back cover blurb: Sometimes staying silent is the only way to survive. 'You only ever ask that. Why did I do it? You never ask what they did.' The winter cold is biting, and a series of assaults is pulling DI Marnie Rome and DS Noah Jake out into the frosty, mean streets of London far more than they'd like. The attacks seem random, but when Marnie's family home is ransacked, there are signs that the burglary can have only been committed by a child - and someone who knows all about her. It will take a prison visit to her foster brother, Stephen, to help Marnie see the connections - and to force both her and Noah to face the truth about the creeping, chilling reaches of a troubled upbringing. For how can a damaged child really leave their past behind them? I'm not sure how she does it, but somehow each of Sarah Hilary's novels surpasses the one before. Quieter than killing is the fourth instalment in the DI Marnie Rome series. They can be read alone, but I would recommend you get your hands on the others if you can - purely because they are so good! A series of violent attacks has left two people seriously injured and another dead. All have previous criminal convictions so it seems an easy enough case for Rome and Jake. Find the vigilante, arrest them, job done. When Marnie Rome's former family home is attacked, her tenants left badly beaten, it appears that there may be links to Marnie's foster brother, Stephen. But he is safely behind bars having committed a heinous crime years earlier. Marnie reluctantly pays Stephen a visit, and gets more than she bargained for. Everything is pointing to his involvement, and when she questions him around this, he tells her that she needs to start looking closer to home. His suggestion is ludicrous to Marnie, what he is proposing happened, that led him to his original crime. But with a murder investigation underway, and very little to go on, Marnie is forced to take into account every single thing she is told. Quieter than killing allows us to get closer to Rome and Jake than we have been previously allowed, and what we already know about them is reiterated. They are both equally determined to come to the right result no matter whether that means compromising relationships, colleagues opinions of them, or having sleepless nights. They are the ultimate team. And thank goodness they are for the case they are tasked with solving in this novel. 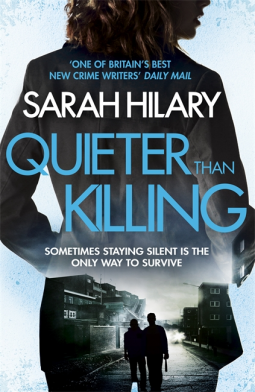 Equally chilling (in more ways than one) and thrilling, Quieter than killing is possibly my favourite Sarah Hilary novel yet, and that ending?! Well, I literally cannot wait for book Five! Quieter Than Killing is available from 9 March 2017.